Despite being repeatedly ravaged by Mount Etna’s eruptions since its founding, Catania retains traces of its long Greek and Roman history, most notably the ancient theaters of the Parco Archeologico Greco-Romano di Catania. The most important ruins in the city, these remarkably preserved theaters are a must-visit for archaeology buffs. Though the remains in the Parco Archeologico Greco-Romano di Catania (Greek and Roman Archaeological Park of Catania) are well maintained, they can be difficult to interpret for the untrained eye and are best visited with a guide who can explain their historic and cultural importance. Most Catania walking and Segway tours include a stop at the archaeological park, along with other top attractions in the city center such as the baroque Piazza Duomo, bustling Via Etnea, and medieval Castello Ursino. The Parco Archeologico Greco-Romano di Catania is home to three main structures—the theater, amphitheater, and odeon—dating back as early as the second century AD, as well as a number of smaller ruins and museums. The Parco Archeologico Greco-Romano di Catania is outdoors, so wear comfortable shoes, sunscreen, and a hat when touring. The archaeological park is accessible to wheelchair users via paved pathways and ramps. 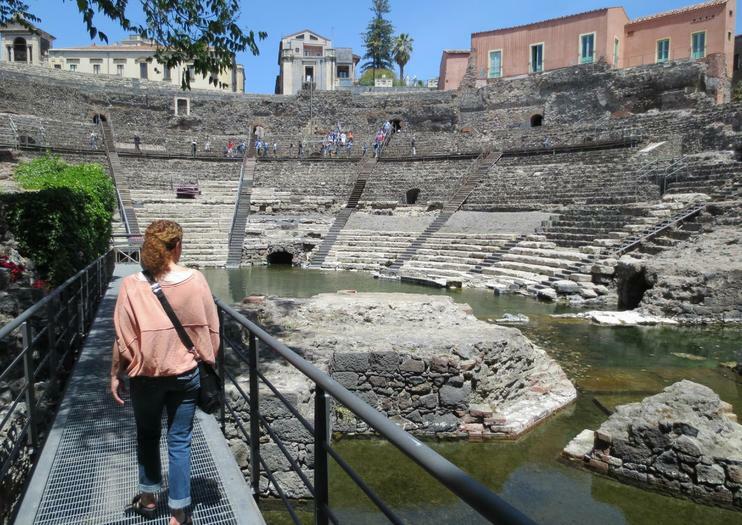 A tour of Catania’s archaeological ruins is especially interesting for Roman history enthusiasts. The Parco Archeologico Greco-Romano di Catania is located in central Catania, just north of Castello Ursino and walking distance from the Catania Centrale train station. The archaeological park is outdoors, so visit in the early morning or late afternoon in the summer months when the temperatures are milder, and during clear, warm days in the winter. The headliners of Catania’s Parco Archeologico Greco-Romano are the Teatro Romano (Roman Theater), formerly an opulent 7,000-seat theater built with marble and black lava stone; the 15,000-seat ancient amphitheater, once the largest of its kind in Sicily; and a smaller but impressive odeon theater. Additional sites in the park include a series of Roman baths and the Casa Pandolfo and Casa Liberti, two small exhibition spaces near the Roman theater that house artifacts discovered during the excavation of the site.